In the Middle wishes all of its readers a very happy 2009. All best to you in the coming year. [image credit: very realistic pseudomedieval coiffure by Great Wigs. This is the Medieval party wig in blonde. I don't know about you, but I purchase all my medieval party wigs from Great Wigs, your source for really great wigs.] [Oh and did I tell you that ITM has started taking paid endorsements? Medieval Party Wigs is an official sponsor of this blog. 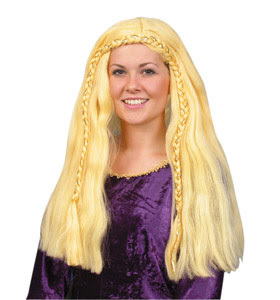 For the best medieval party wigs at the best prices, shop Great Wigs. For £6.22 you can't go wrong!] [Also, this wig will improve your teaching prowess. I will be wearing it throughout 2009, kind of like Tiger Woods with the Nike swoosh].